A-tellin' me I've got to beware. I think it's time we stop children, what's that sound? There's battle lines bein' drawn. A-gettin' so much resistance from behind. What a field day for the     heat. Mostly sayin' hooray for our side. Step out of line, the men come and take you away. We better stop hey, what's that sound? 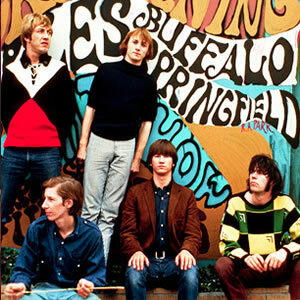 The song was inspired by an event at the dawn of the psychedelic era in November 1966, the year during which Buffalo Springfield started playing as the house band at the Whisky a Go Go on the Sunset Strip in Los Angeles. According to the Los Angeles Times, annoyed residents and business owners in the district had encouraged the passage of strict (10:00pm) curfew and loitering laws to reduce the traffic congestion resulting from crowds of young club patrons. This was subsequently perceived by young, local rock music fans as an infringement on their civil rights, and on Saturday, November 12, 1966, fliers were distributed along the Strip inviting people to demonstrate later that day. Hours before the protest one of L.A's rock 'n' roll radio stations announced there would be a rally at Pandora's Box, a club at the corner of Sunset Boulevard and Crescent Heights, and cautioned people to tread carefully. The Times reported that as many as 1,000 youthful demonstrators, including such celebrities as Jack Nicholson and Peter Fonda (who was afterward handcuffed by police), erupted in protest against the perceived repressive enforcement of these recently invoked curfew laws. Though often mistaken for an anti-war song, it was this first of the "Sunset Strip riots" which inspired then Buffalo Springfield band member Stephen Stills to write "For What It’s Worth", recorded about three weeks after on December 5, 1966. Robert Plant (later to become the vocalist of rock group Led Zeppelin) recorded the song with his Band of Joy in 1968.